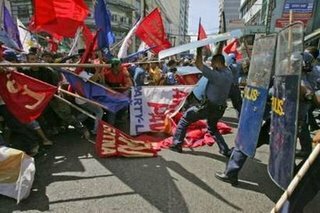 Manila, Philippines - 1,000 people demonstrated against state killlings of activists in the Philippines, and fought repeatedly with police who were attempting to disperse them with water cannons and batons. One cop received a fractured skull. An estimated 680 leftists have been killed or 'disappeared' by the Arroyo government in its 5 years in power. Kenya - Villagers blocked a highway with burning barricades and threw stones at police who arrived to disperse them with tear gas. The protest was against the diversion of the Rongai river, their only water source, to support a commercial flower farm.